Five Peachtree City teens and one from Newnan have been charged with criminal damage and intimidating a witness in a May 13 incident involving the homes of victims associated with the recent arrest of McIntosh High School coach David Munoz on sexual battery charges. Five of the offenders, all students at McIntosh High School, live in Peachtree City. 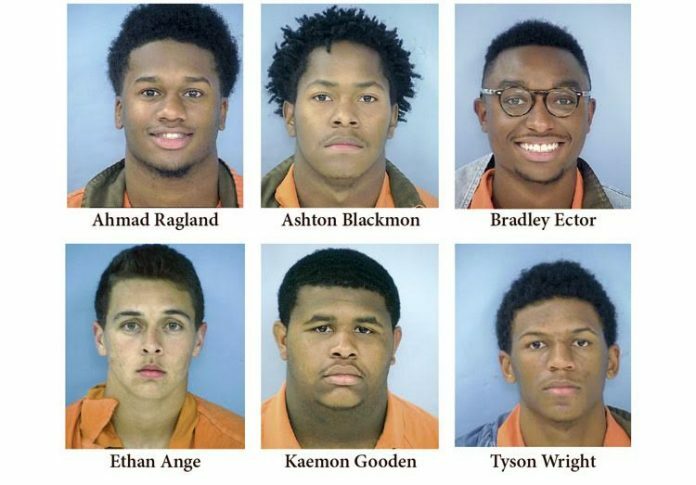 Those include 18-year-old Bradley A. Ector, 18-year-old Ethan H. Ange, 18-year-old Ahmad D. Ragland, 18-year-old Kaemon M. Gooden and 18-year-old Tyson J. Wright. Also arrested was 18-year-old Newnan resident Ashton R. Blackmon, according to Fayette County Jail records. Peachtree City police said officers on May 13 received reports of vandalism of two homes in different parts of the city. Both victims of vandalism were also victims in a recent case that resulted in the arrest of McIntosh High School baseball coach David Munoz. The charges for each of the males included two counts of second degree criminal damage to property and two counts of influencing witnesses, according to jail records. McIntosh High School baseball coach David Munoz was arrested on April 24 on felony sexual battery charges involving a student. Munoz on May 9 was charged with three counts of misdemeanor sexual battery involving three additional students based on alleged incidents that occurred on school property. An investigation into the vandalism revealed evidence that six, 18-year-old males were responsible, police said. Peachtree City Police Department spokesperson Odilia Bergh said the incidents included damage to windows, roofs, exterior surfaces and vehicles. Investigators obtained warrants on May 15, and each of the offenders turned themselves in at the Fayette County Jail.